I wish pigs in a blanket were really cute pigs in a warm blanket not sausages made out of actual pigs. And who needs sausages anyway when you have delicious, juicy and vibrant carrots? I must be honest and confess that this recipe idea was actually created by my boyfriend. We were visiting our vegetarian friends and we had a pack of puff pastry and a bunch of carrots. 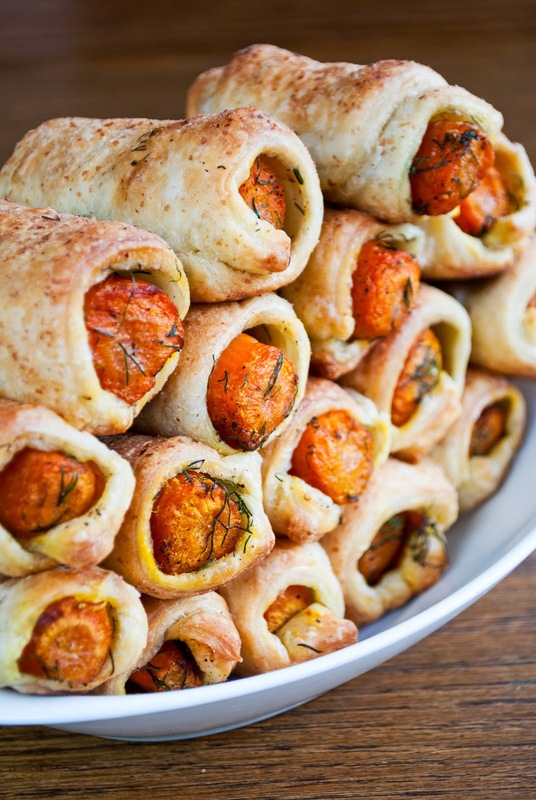 And the recipe for carrots in a blanket was born. I just LOVE recipes like these - so simple, cheap and so delicious in its simplicity. Carrots really shine in this dish. Add fresh dill to the filling and before you know you have eaten at least 4 of those cute little pies! Take the puff pastry out of the freezer and put it in a regular fridge at least a couple of hours before baking. Wash the carrots, cut them in half and boil them until soft. Drain and let them cool. Now peel them and cook them on a pan in hot oil (not deep-frying, just regular pan-frying) until golden brown. Add some salt and pepper to taste. I fried the carrots in two batches, since there were many. Mix the carrots with chopped fresh dill. Pre-heat the oven to 430 F / 220 C . Roll out the puff pastry on a floured surface. Cut out 24 squares and roll a carrot into every square. Cover the baking tray with a parchment paper and put the pies on it. Bake for 15 minutes at 430 F / 220 C. Serve as a snack or with soup. Hello! My name is Sandra. 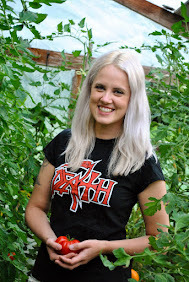 I'm a published cookbook author who lives in the woods and plays drums in a death metal band (Neoandertals). My recipes are easy, delicious and affordable. Welcome to my humble cabin! Sunflower seeds are the new cashews!